It is not just poetic nicety to say that forests, biodiversity and nature have an impact on our consciousness and mental wellbeing. The founders of religions such as Buddhism, Christianity and Islam were closely associated with nature in the process of achieving an elevated mental state. The Buddha’s advice to his monks was to choose trees which suffered a natural demise for the construction of their forest habitat. In the Buddhacarita, the epic poem on the life of the Buddha, spiritual practice is compared to a tree where the fibres are likened to patience, flowers to virtue and the boughs to awareness and wisdom which brings forth the fruit of Dhamma. To find someone who is truly following the ‘Buddhist path’ in how we view and work with forests maybe difficult, but one of Sri Lanka’s eminent ecologists who set about finding a foresting concept that is not removed from man and his own wellbeing, considers the Buddha one of the best proponents of environmental and biodiversity protection. Dr. Ranil Senanayake who introduced to the world the concept of ‘analog foresting’ (man-made forests that do not distort nature but work with nature) is one of the best examples of weaving Buddhist wisdom with his technical knowledge of ecology. Having qualified in ecology, epidemiological history and biogeography from the University of California, he returned to Sri Lanka in 1978 as one of South Asia’s first systems ecologists and joined the newly created Ministry of Mahaveli as a consultant ecologist. “The question that was posed to me when I expressed my opposition to even-aged monoculture plantations as forestry was: If not even-aged monocultures, then what? I was questioning the forestry experts on their model of effective forest restoration. I was proposing diversity. But where was my model for this type of forest? Jobless, blackballed and driven by a sense of responsibility to the land, I set out to create the model. Selling my home in Colombo, I bought a small, degraded tea estate in the village of Mirahawatte, and began to develop a ‘forest’ on it using the lessons in ecology I had learnt. Residing there and raising my three sons, I began to work on an answer to the monoculture model. 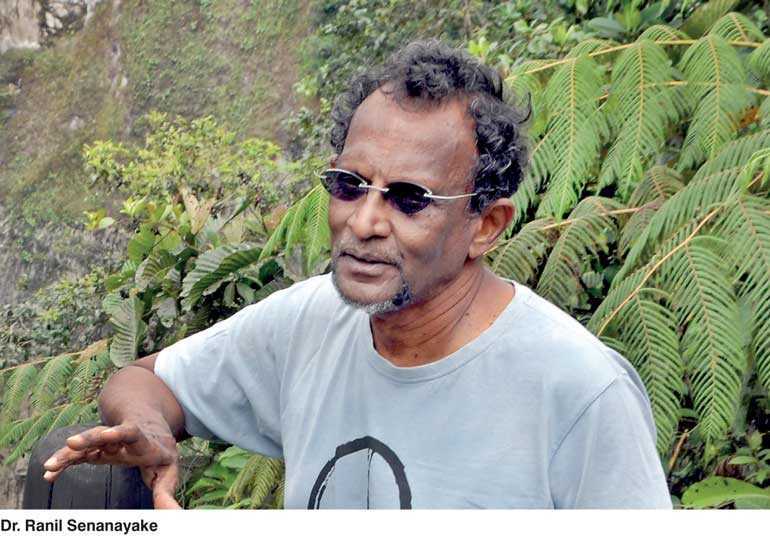 Today, 40 years after his advice was shunned in Sri Lanka, Ranil Senanayake is one of the most sought after ecologists by the rest of the world and his concept of analog foresting has been adopted by over 20 countries. Q: You started your journey to encourage the art or rather science of natural foresting over 30 years ago. You have called it analog foresting. Could you trace how you came about to begin this journey and explain the term ‘analog’ foresting? A: Analog Forestry means mimicking a forest in its structure and function, so that it looks, feels and acts much like the old forest. The difference is that many of the species we use may be from other forests, other areas, but all contribute to the economy and well-being of the farmer. I have been interested in wildlife from childhood, my early days of travelling with Sri Lanka’s pioneer free diver and field naturalist Vicky Atukorale, also studying with Prof. Michael Soule, a pioneer of Conservation Biology, made me acutely aware of the disappearance of our biodiversity. When the issue of the loss of forests was raised, the official response was, ‘we are reforesting to make up for the lost forests’. My study of these new ‘forests’, funded and supported by most multilateral donors did not demonstrate any of the attributes of the natural forest. Thus I began to look at the native forests in terms of its biodiversity and ecosystem functions and using botanical knowledge began to design analogous structures. I reasoned that ‘As nature is the best designer of any forest, following her design in restoration would be most effective’. Q: In the recent years in Sri Lanka we have seen the drying up of waterfalls, lakes, rivers and streams. Do you see a connection between the pine forests we have grown and depletion of ground water as well as soil degradation? A: There are two issues here, one is the drying up of the upland watersheds, and the other is the effect of Pinus monocultures. The upland watersheds are most heavily impacted by vegetable cultivation that drain and dry out the montane wetlands to plant their crops on. These were the water reservoirs that once fed the springs through the dry weather. Compounding this loss is the planting of Pinus monocultures on the mountains as these plantations do not support the creation of soils that hold rainwater. To make things worse, the local organisms do not easily breakdown the Pine needles, which collect underneath and becomes an annual fire hazard. This degrades the soil by destroying the surface soil microorganisms and retards rainwater infiltration. Q: The analog forest arboretum created by you in Mirahawatte, Belipola, is not only a man created forest but it is also a vast source of plant-based produce which gives jobs to the villagers. Are you working with the private sector to help foster this model of business for small and medium scale agriculture? Q: Could you speak more of the future plans of the initiatives you created; Rainforest Rescue International (RRI) and Forests For the Future? A: We need organisations like RRI to provide the technical and physical material for the public to participate in land restoration. By creating new and innovative approaches to land and landscape restoration we hope to facilitate the public to participate in the creation of their future (www.fff.lk). With the Forests for the Future program, one can choose the type of tree they would like planted, choose the area it should be planted on. Then this will be done with GPS locations with an annual evaluation of the tree reported on for three years. Q: Your analog foresting model has been adopted by over 20 countries in the world but has received scant political recognition in Sri Lanka. Could you comment on this? A: As the only Systems Ecologist in the country I have not had a single consultancy nor any government appointment for over 35 years. This is the price I have paid for being informed, forthright and honest. So it is no surprise that my work has not received political attention too. But as you point out, there are many people in other countries who are concerned about their own nations and it is an honour to assist them in their noble work. Q: What do you think of the current macro development trends in Sri Lanka? A: Total idiocy. Building a huge fossil dependent infrastructure that promotes the consumption of fossil and non-renewable resources as ‘development’ is the sign of ignorance of scientific realities. Politicians who are ignorant of modern trends and stuck in the development paradigm of the past, can only see the dreams of yesteryear. They do not care about the future that they create nor the human cost of living with the problems created by them. If full cost accounting was applied to these mega projects the illogic of these decisions will become obvious. Q: How do you see the concept of ‘development’? A: I concur with the Rt. D.S. Senanayake, the ‘father’ of this nation, who said a primary measure of success in development was the ‘larder of the poorest of this nation’. Development, a word that means ‘a gradual unfolding’ must refer to the human condition as a primary pre requisite. Abstract metrics such as economic performance must not define growth. The human condition and an environment benign for sustaining health, should be obvious goals. Q: Do you think Sri Lanka has missed a chance not to ape other countries and create a model unique to itself based on its own natural resources and strengths, the way Singapore did at the time? With ill-educated leaders who as Eric Gill states, “are proud to progress not knowing wither’, we have missed that chance. The only hope is for the new generation to define an honourable identity for the future. Q: Connection with the environment or love for it is as far removed as love for genuine knowledge in the current rote learning education system of Sri Lanka. Could you explain on how RRI is working with the younger generations of Sri Lanka to foster love and protection of bio diversity? A: As Carl Jung famously pointed out: “Those who know nothing about nature, are of course neurotic, for they are not adapted to reality.” Much of the younger generations have a decreasing knowledge of nature proportional to their ‘developed’ lifestyle. All studies on low opportunity urban youth placed in a forest setting, show a surge of mental and physical well-being. RRI, through the maintenance of ‘experiential sites’ as in Belipola or Hiniduma, create the opportunity to ‘experience’ the goal. We facilitate the creation of conservation groups such as the ‘Rainforest Rangers’ who learn to monitor their local environments and by creating media that strives to imbibe our youth with an understanding and love of our environment and its biodiversity. Q: Tea cultivation is one of the reasons blamed for deforestation. As you were once a tea planter yourself, could you explain radical methods that could be incorporated where tea too is grown in the foresting method? “I know of no more awe-inspiring sight, than that of a thousand acres on fire. Sheets of flame appear to leap into the air, and yell with a sort of devilish delight at their victory over the magnificent trees they are reducing into charred masses of cinder and charcoal. It is more than impressive, it is fearful, yet grand! After the fire has completed its work, the land is covered with black logs, lumps of charred timber, masses, and often great fragments of stones, broken by the heat that has swept over them. A deep black covers the landscape; impressive, but depressing. It was in a burned wilderness like this, that I found my new home. It lay at the extreme end of one of the many blocks of land that had been simultaneously burned off. My path, for road it could not be then called led over hundreds of fallen and charred logs, and followed the valley of the Agra stream. When morning broke upon the day following the events recorded at the conclusion of the last chapter, I found myself gazing upon a scene not altogether unfamiliar to me. All around me lay hundreds of charred black logs, stumps in fantastic shapes and outlines: fallen branches, broken and distorted by fire: cinder heaps, and little rivulets of sodden ash: all indicative of the fierce, merciless fire that but a few weeks ago, had raged over a spot that so lately had been a beautiful forest land. As a planter, the wealth that could be generated was the obvious goal. But the shadows of the mighty forests and soils that existed for over 20 million years began to weigh heavy, over the well-manicured carpets of green that I was managing for investors of that ‘fleeting wealth’. The need to change the tea landscapes from a uniform monoculture into a more diverse, more productive landscape might be an effective adaptive response to both climate change and modern market demands. Q: How can this be done? Tea after all is one of the mainstays of the economy and there are rather rigid ways of growing tea (as a monoculture) that Sri Lankans have inherited from British experiments. A: Through the mobilisation of the values currently set on biodiversity and Ecosystem Services (ES). With an estimated global value of over 14 trillion dollars (Robert Constanza), it would certainly seem to match the metrics of the GDP that that we are currently chasing as ‘development’. As you get more ecosystem services from a polyculture as opposed to a monoculture, the need for change becomes obvious. Q: With regard to the group of tea growers in Galle district that RRI works with, to promote ‘forest tea gardens’, could you briefly explain how this works and if the profit margins are different as when tea is grown as a monoculture? A: In the Forest Tea Garden concept, the initial gain is from the savings spent on chemicals and on fertiliser. The Forest Tea Gardens also produce their own compost which is another saving. The tea planting is interspersed with a vertical growth comprised of pepper, cloves, and fruit in a way that the tea receives the optimal sunlight for production. The increased income from the new crops in the tea not only generates a better income, it also spreads the risk of market failure and price depression. Q: What is your view on the herbicide Glyphosate? It was banned without a single scientific study being undertaken in Sri Lanka and was replaced with weedicide many times more harmful. Your comments? A: Glyphosate is a symptom of the collapse of our agro-ecosystems. It is also a symptom of Invasive Exotic Ecosystems being foisted on our landscapes without any idea on how to manage them without the use of toxic chemicals. I do not know the oversight process with the Registrar of Pesticides, but the quantum of chemicals released into our environment without any study on their effect on the native biota is massive. I would welcome a ban on all agro toxins, but sadly we have descended to the level of addicts in our current agricultural skills and capacity. We are hooked on them, toxic as they are and we have to eat. Unless there is an informed long term action to wean away from these toxins we are lost! If we continue on the path of choosing the lesser toxic substance in food production, we will learn to tolerate small increases, until too late! Glyphosate is merely a symbol of the dichotomy before humanity. ‘Man or Market’? Q: Back to the general topic of forest and man, it could be argued that as time evolves and population grows, that it is unpreventable that man would need to seek some space that was earlier totally left to the devices of nature. What your initiative of analog forest attempts is to bridge the gap between man and nature and show man that forests could be created for his agro-economic and mental wellbeing – how do you think this concept should be made friendlier to modern man? A: First, it is how you see a forest. Let me give you two examples: The Buddha states: ‘The forest is a peculiar organism of unlimited kindness and benevolence that makes no demand for its sustenance and extends generously the products of its life activity; it affords protection to all beings, offering shade even to the axe man who would destroy it’; while in 1902 the Head of US Forest Service says: ‘The first and foremost purpose of a forest growth is to supply us with wood material; it is the substance of the trees itself, not their fruit, their beauty, their shade, their shelter, that constitutes the primary object’. Sadly it is the latter view that has dominated modern ‘forestry’ and contributed to a narrow, utilitarian view of forests worldwide. An urgent turnaround is required we must question our understanding of what a ‘forest’ means to us. Can we appreciate it for its ecosystem services? Can we see it as ‘an organism’? Q: Could you offer some additional advice to Sri Lankans on the topics of forests and biodiversity? A: Understand the forest as described by the Buddha. Understand the land as described by the tradition. Understand the meaning of ritual.